Is the American Dream dead? If home ownership as an attainable goal for the average American is the yardstick, then it is struggling – and currently in worse shape than it has been since the time of Richard Nixon, with one exception. This graph shows the median price for a single-family home in the inaugural year of each of the nine most recent U.S. presidents and compares it to the median annual family income at those times. Both prices and wages are adjusted for inflation, i.e. expressed in 2016 dollars. House prices are provided by the National Association of Realtors, wages by the U.S. Census. Of course, we shouldn't blame presidents for high house prices or low wages in their first year in office. That's what we (and they) have previous presidents for. In 1969, just as Richard Nixon began his first presidential term, the median price for a single-family home was just under $140,000. The median family income meanwhile was $55,500. The difference between both was a bit more than $83,000. Or, expressed in terms of earnings, 1.53 times the annual income at the time. In 1973, at the start of Nixon's ill-fated second term, median family income had gone up by about $3,800 – but the price of a median single-family home had increased by roughly $18,000. The gap between wages and house prices had risen to just over $98,000, or 1.68 times median annual earnings per family. By August of 1974, when Gerald Ford took over the presidency from the disgraced Nixon, that gap had grown to more than $100,000, or 1.83 times median annual family earnings. In the mid-1970s, America suffered economic as well as political turmoil, with median house prices dropping more than $3,000 by the time Jimmy Carter took the presidential oath in 1977. As median income had risen, albeit modestly, the gap between annual income and average house prices again dropped below $100,000 – and to 1.71 times median annual earnings. Both trends had reversed four years later, at the inauguration of Ronald Reagan in 1981: family income had dropped by close to $1,000 while house prices had gone up by about $13,500. The gap had cracked wide open, to more than $113,500 (exactly twice the median family income). But by the start of Reagan’s second term in 1985, rising wages and falling house prices had reduced the gap again to $105,500, or 1.79 times the median family income. In 1989, George H.W. Bush took office after eight years in which family income had shot up almost twice as fast as single-family house prices. Even if the gap shrank by only a few thousand dollars, the number of years an American on a median wage had to work to earn as much as the worth of a median single-family house dropped to 1.73. Despite the fact that the difference in dollar terms crept up during the Clinton years and the first tenure of the second Bush, to $125,000 in 2001, the difference as expressed in annual wages yo-yoed, up to 1.83 as Clinton began his first term, down again to 1.78 when he started his second one, and up again to 1.80 as Bush Jr. took over. A sea change occurred in the second Bush’s first four years. Median family income stagnated at around $69,000 while almost $45,000 was added to house prices. The gap between both widened dramatically, to $170,000. More than the price of an entire single-family house just over 35 years earlier. And 2.47 times the annual median earnings of an American family. Things have never been more precarious for aspiring homeowners – so far. 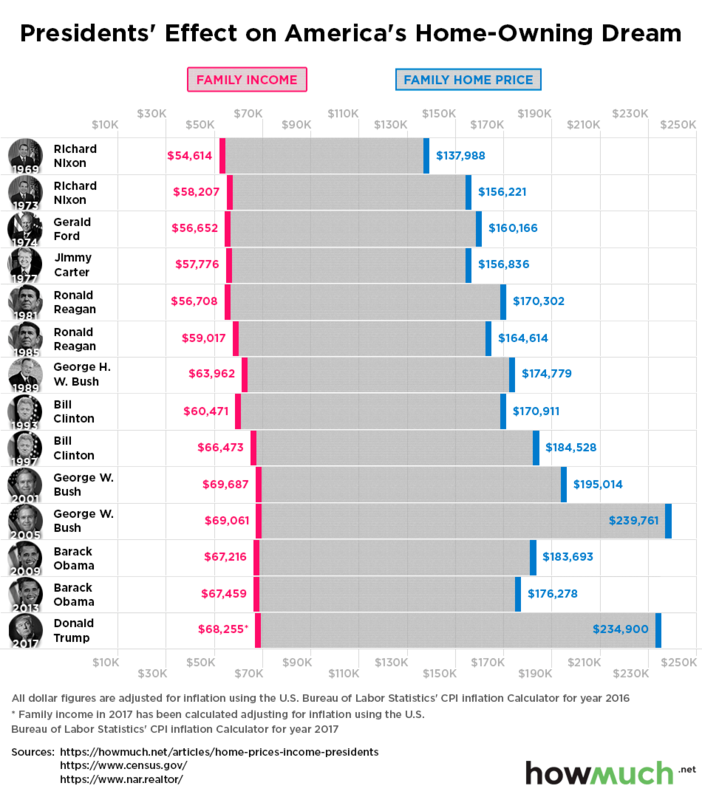 The difference shrank dramatically by the time of Obama’s first and second inauguration: to about $116,500 and just under $109,000 respectively, or 1.73 and 1.61 times the annual median family income. House prices have shot up over the last four years to $235,000 – the second-highest they have been in an inaugural year since the re-election of George W. Bush. Median family income, meanwhile, is slightly lower. As the Trump era begins, the gap between annual median family income and median single-family house price is just over $166,500, or 2.44 times the median family income. Will the curve take another downward turn, or will the gap continue to widen this time? Much depends on how Trump handles the economy. And whether he succeeds or not in shortening the financial distance between average-earning Americans and their home-owning dream will help determine whether there will be a second Trump term or not.